If you're planning on being a dark side leader in the Star Wars galaxy, there's one thing you'll absolutely need for the job. It's not a massive, heavily armed starship to use as a base of operations, or a legion of stormtroopers at your disposal to do your dirty work (although those definitely help), or even a lightsaber to intimidate your foes with. Leading the First Order towards victory over the New Republic is dangerous work, so you better wear your helmet! 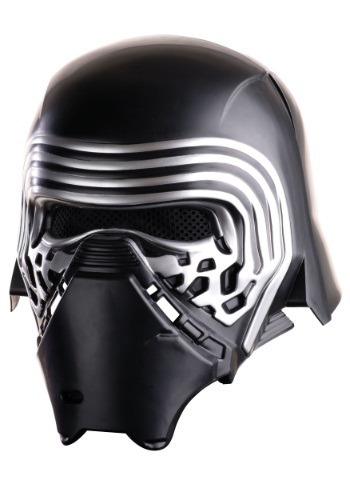 We're not saying this official Star Wars Deluxe Kylo Ren Helmet will hand you the galaxy on a big shiny platter. It's still going to take plenty of strategy and probably a super-weapon or two. But wearing this meticulously detailed, molded-plastic headgear with the rest of your Kylo Ren costume will have you looking like the villain from The Force Awakens, which will instantly improve the morale among your troops and get them ready for their next mission! Though, you may still want to grab one of those awesome crossguarded lightsaber accessories to go with your costume, just in case they need a bit more “morale”.